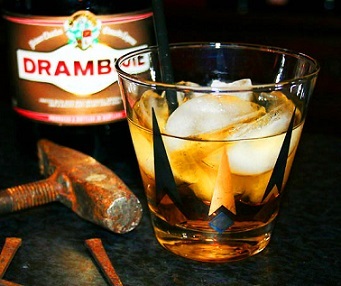 I'm afraid to admit it, but I remember how popular a Rusty Nail was in the 1960's and 70's. "Everyone" was trying one, in part because the "rat pack" celebrities. I don't have customers order many of these anymore unless I put the drink on the restaurant special sheet. I must be getting old(er) because a lot of the restaurant guests have never heard of this beverage or if they have they hint that it must be an old person's drink. Maybe so ...my husband and I still enjoy one once in a while, especially on a chilly winter evening. I was chilly and thought I'd turn up the heat. Instead, he got up and put a throw across my lap and said he knew a way to warm me up even more. I could hardly believe what I heard! But then he brought me a Rusty Nail. "Remember this drink?" he asked. 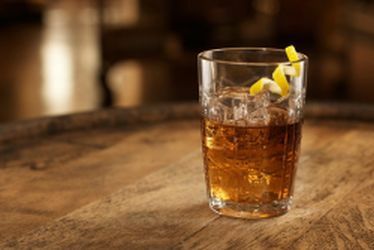 This two liquor drink combines a fine Scotch (Dewars, Cutty Sark, J & B or Johnny Walker or your choice) with the sweet honey taste of Drambuie, a Scotch based liqueur. It is usually served on the rocks, but can also be enjoyed "up" (no ice). 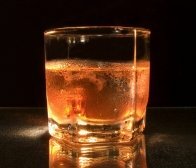 If people who drink blended Scotch would try this famous drink I believe they would like the beverage. It was at one time promoted as "the drink that satisfies."